The holidays got in the way of blogging, Gentle Readers. I hope you had a good time too and that our 2018 will have substantially more good news than 2017 did. When last we left Kansas, the antislavery men around Osawatomie got word that proslavery forces moved again on Lawrence. The Pottawatomie Rifles, led by John Brown’s son, and the man himself set out to link up with other militia groups and go to the town’s relief. Contradictory messages kept the company uncertain of what to do until the town surrendered and the proslavery men ran amok. Disheartened, the Rifles decided they could do no good at Lawrence on their own and turned for home. I have all this from a Henry Williams, who wrote it for the New York Tribune. Williams has John Brown Junior go into Lawrence on May 25, where he saw the destruction. Then the company met and decided on going home. Everyone went home separately, so Williams loses track of the Browns from that point. Lawrence was destroyed in this way: Their leading men has (as I think) decided, in a very cowardly manner not to resist any process having any Government official service it, notwithstanding the process might be wholly a bogus affair. The consequence was that a man called a United States marshal came on with a horde of ruffians which he called his posse, and after arresting a few persons turned the ruffians loose on the defenceless people. The robbed the inhabitants of their money and other property, and even women of their ornaments, and burned considerable of the town. Leaving aside Brown’s military judgment, a lifelong habit of his own, he has the facts about right. He left out that the militiamen turned for home after a meeting with Second Lieutenant John R. Church, First Cavalry, who informed them of his orders to disperse any armed bands he found. At some point in these few days, probably on the 25th when the other companies that had joined the Rifles split up, the elder Brown and his company parted ways with Junior’s men. “The arrival of those slave sin camp next morning caused a commotion,” so their liberator has recorded. “The act of freeing them, though attended by no violence or bloodshed, was freely denounced, and in accordance with a vote given by a large majority of the men, those free persons, in opposition to my expressed will, were returned to their master. The man who took them back got a saddle for his troubles. One good turn among white men must have deserved another. The Rifles took up arms to keep white men free or at least saw freeing slaves as more trouble than they wanted just then. Actually seizing enslaved people and freeing them did ask more of white Americans than abstract condemnations and returning enslaved people to their enslavers would fit broadly into the antislavery mainstream in Kansas even prior to this. With Lawrence destroyed and the free state leadership under arrest, even more committed antislavery men might not want to stick their necks out in the moment. Jason Brown, Villard’s source for this, wrote that the news brought “great excitement and fear” which turned the company resolutely against both of the Brown boys. One more John Brown letter. Regular posts resume Monday. Your & Watsons Letter to the Boys, & Myself of Decem 30th & Jany 1st were received by last Mail. We are all very glad to hear again of your welfare; & I am particularly grateful when I am noticed by a letter from you. I have just taken out Two Letters for Henry One of which I suppose is from Ruth. Salmon & myself are so far on our way home from Missouri; & only reached Mr Adairs last night. They are all well & we know of nothing but all are well at the Boys Shantees. The weather continues very severe; & it is now nearly Six Weeks that the Snow has been almost constantly driven (like dry Sand) by the fierce Winds of Kansas. Mr, Adair has been collecting Ice of late from the Osage River; which is 9 1/2 Inches thick, of perfect clean sollid Ice, formed under the Snow. By means of the sale of our Horse & Wagon: our present wants are tolerably well met; so that if health is continued to us we shall not probably suffer much. The idea of again visiting those of my dear family at North Elba; is so calculated to unMan mme that I seldom allow any thoughts to dwell uppon it: & I do not think best to write much about it. “Suffise it to Say”; that God is abundantly able to keep both us, & you: & in him let us all trust. We have just learned of some new; & shocking outrages at Leavenworth: & that the Free State people there have fled to Lawrence: which place is again threatened with an attack. Should that take place we may soon again be called uppon to “buckle on our Armor”; which by the help of God we will do: when I suppose Henry, & Oliver will have a chance. My judgment is; that we shall have no more general disturbance until warm weather. I have more to say; but not time now to say it. So farewell for this time. Write. Henry H. Williams, who lived near the Pottawatomie, got the word on Wednesday, May 21, 1856. The Border Ruffians, under the leadership of IB Donaldson and Samuel Jones, had come for Lawrence again as long expected. He mounted up and rode the ten miles “to arouse” the Pottawatomie Rifles under the command of John Brown’s son. At about four in the afternoon, everyone gathered where the Osawattomie and the California road met. They waited on two other companies, the Marion Rifles and Pomeroy Guards, but only two men showed from those groups. The roused Rifles soon had a second messenger from Lawrence, who contradicted the previous and seems to have said they should stay put and wait on further word. They would have none of that and resolved to go and find out the situation for themselves. That brought them to a third messenger, who reported the town’s surrender and subsequent destruction. This startling news was received in silence by the company. Then the word “Onward” was passed along the line, and although scarcely a word was spoken, the thoughts of every man could be read in his countenance. We pushed on, and a messenger was dispatched the arouse the settlers at Osawattamie. More bad news came in: No free state militia operated in or near Lawrence. The Border Ruffians held Blanton’s Bridge and still had a force in Lecompton. That looked like more than thirty-odd men could handle, so they camped at Prairie City and hoped that more men would appear. Company C of the Kansas Volunteers and the Pomeroy Guards joined them on May 23. That evening, the news came that proslavery men had taken Charles Robinson off his steamer and hauled him back to Kansas. The militias considered their next course. Lawrence would not fight for itself and they couldn’t carry that battle on their own, so everyone agreed to go home and look to their own defense. On our return from Palmyra we received intelligence of a disturbance on Potawatamie Creek, in which five men were killed. Asked to come, with guns, John Brown set his mind on going to Kansas. He had no money to go and to arm himself or supply his sons who had already gone, but a quick appeal to an antislavery convention fixed that. 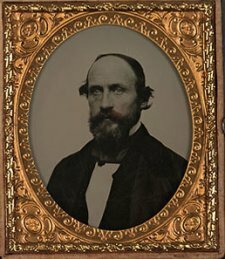 Brown would set out on a holy mission to fight slavery, protect his children, and generally make himself and his frontier expertise available to white colonists. His first biographer, James Redpath, stresses that Brown never meant to make his own future in Kansas. 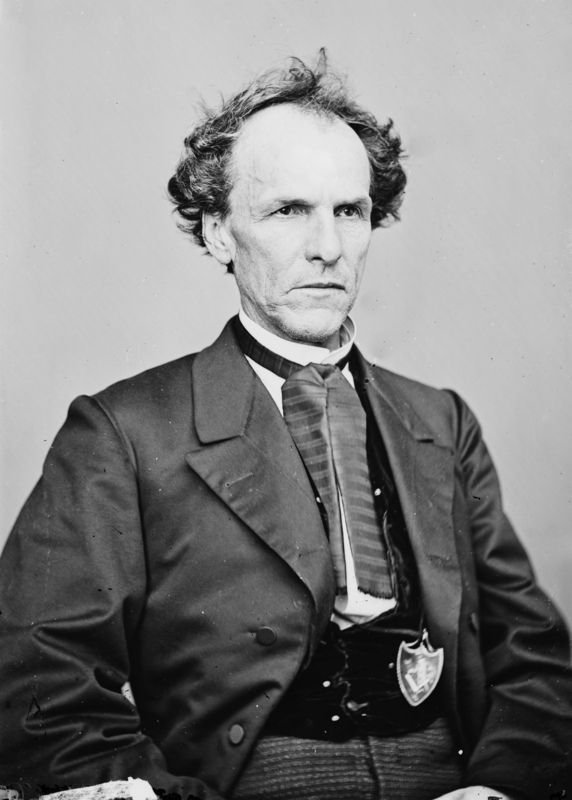 Proslavery men cast him as a fanatic for that, bent on trekking across the country to fight someone else’s battles. I doubt any said the same about Jefferson Buford. Redpath spends a page defending Brown from that onslaught. His defense amounts to the argument that Brown came to help his sons as well as to fight slavery. Furthermore, even if Brown had done just as his enemies thought and come all that way for one cause, so what? John Brown did not dare to remain tending sheep at North Elba when the American Goliath and his hosts were in the field, defying the little armies of the living Lord, and sowing desolation and great sorrow on the soil set apart for his chosen people. 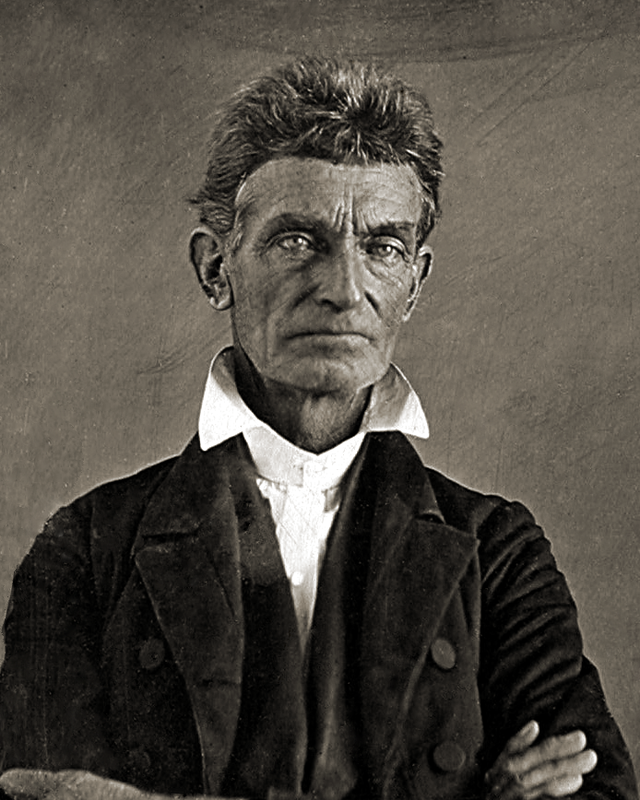 Either Freedom has no rights, and the Bible is a lie, or John Brown, in thus acting, was a patriot and a consistent Christian. the old man, John Brown, and his four sons, arrived in Lawrence. The balance he reported sick. As they drove up in front of the Free State hotel, they were all standing in a small lumber wagon. To each of their persons was strapped a short, heavy broadsword. Each was supplied with a goodly number of fire-arms and navy revolvers, and poles were standing endwise around the wagon box, with fixed bayonets pointing upwards. They looked really formidable, and were received with great eclat. commenced fomenting difficulties in camp, disregarding the command of superior officers, and trying to induce the men to go down to Franklin, and make an attack upon the pro-slavery forces encamped there.